Learn how to apply a license code (coupon code) on the web as either a new user or an existing Skritter user. Go to the Skritter signup page and create your account. 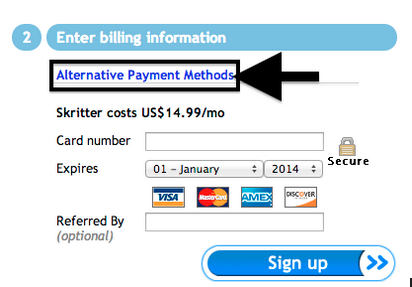 Click on Alternative Payment Methods under the billing information header. Click on the coupon code link. Enter your code and click on the blue Sign up button. The prepaid time will automatically be applied to your account! 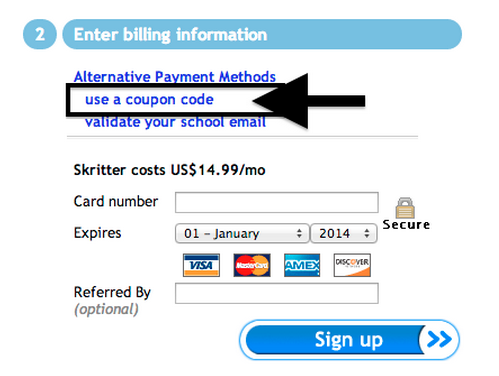 Go to the “ Use Coupon” page on the Skritter website, or go to your " Account" page. Select use coupon under the Billing header. Enter your coupon code in the field provided, and click on the Submit Coupon button.